This is a crafty move that manages to challenge the regime’s spin on the recent Arab uprisings by calling them out on their voiced support for them, and by reminding the regime that if the Iranian people want to, they can continue to stir trouble for the regime–like they did so after the fraudelent 2009 presidential elections. They are forcing the regime to basically put their money where their mouth is. Decide between one of two bad choices for the regime. Either allow the protests and see for themselves what the people of Iran really want, or deny the protests and lose even more credibility–both internally and internationally. (1) Khamenei, members of parliament, IRGC and Basij leaders have all expressed support for the protests in Tunisia and Egypt — trying to lay claim to them as Islamic in nature. (2) The regime, by publicly supporting democratic uprisings in other countries, uprisings that at their core are in the name of freedom, justice and equality, is implicitly making the claim that the Islamic Republic believes in these same values. 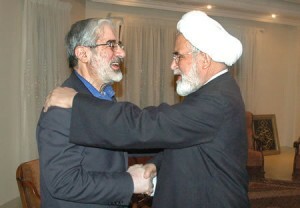 Mousavi and Karroubi have deftly cornered the regime. On the one-hand, if the regime grants the requested permission to hold the protests, it will open up a space for Iranians to vent their opposition to the regime — as they did so in the millions in the 2009 uprisings against the fraudulent presidential election. On the other hand (and far more likely to be the case) if the regime denies the request, then it basically says to all Iranians and to the world that the leaders of Iran don’t believe their own people deserve the very same rights and freedoms that the uprisings in Egypt and Tunisia aspire to. And even more telling, if the regime doesn’t grant permission to hold the requested rally, it shows that they don’t believe their own line, that the uprisings are inspired by the 1979 “Islamic” revolution in Iran. It shows that the regime knows that Mousavi and Karroubi are correct in their assertion that the uprisings in the Arab world were are part of a trend that began with the 2009 green uprising in Iran. Either way, for the regime it will be a tough pill to swallow.